This particular Arkansas golden healer Hera crystal is a transmitter of small cabinet size, 1-3/4x 2-1/2x 1", and features rainbow penetrators, foils, drusy, record keepers, see-through, and more rainbows. 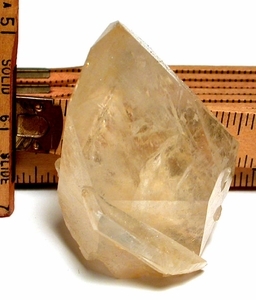 One fleabite and areas of velvety, second generation sparkle quartz you will feel and see. We highly recommend it!